UFC 229 will see the return of Conor McGregor. Conor hasn’t fought in the UFC since winning the lightweight belt from Eddie Alvarez back in November of 2016, instead focusing his energy on the money fight boxing match with Floyd Mayweather in 2017. At UFC 229 Conor will be looking to get his lightweight belt back from Khabib Nurmagomedov who won the vacant title after it was stripped from Conor due to inactivity. This UFC 229 card is being touted as the biggest card in UFC history. At this time UFC 202 holds the record for highest pay-per-view buys in UFC history for the McGregor vs Diaz rematch. UFC 202 was a decent card, but it wasn’t built up with other must-see fights, instead relying on the main event to bring in all of the PPV dollars. The UFC is sticking with this strategy for UFC 229 with a decent, but not remarkable card supporting the main event. Tony Ferguson vs Anthony Pettis is the co-main event, with Ovince Saint Preux vs Dominick Reyes, Derrick Lewis vs Alexander Volkov and Michelle Waterson vs Felice Herrig finishing out the main card. I’m expecting UFC 229 to come closer to 2 million PPV buys and the hype will also bring in several new bettors for the McGregor vs Khabib fight. For this reason I wanted add this 3 step guide to help new bettors get bets placed on UFC 229 from the United States. BetOnline.ag is our recommended sportsbook for Americans looking to bet on UFC 229 online. BetOnline is one of the top sportsbooks serving the United States and unlike many other betting sites that accept Americans, BetOnline does not restrict any States. This means whether you live in California, New York, New Jersey, Texas, Florida or anywhere else, you can bet on UFC 229 at BetOnline. As you can see Khabib is a significant favorite in this fight. The odds may change in the next 36 hours as we get closer to the fight. 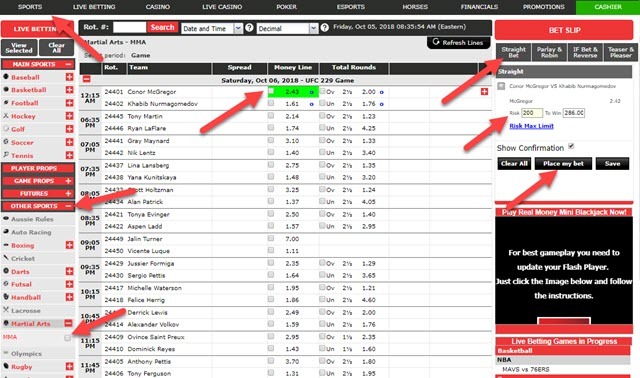 To see all of the odds for UFC 229 you can visit BetOnline.ag, click on ‘Sports’ from the top navigation bar, open the ‘Other Sports’ drop down menu and select ‘Martial Arts’. Complete these three steps to get your UFC 229 bets placed online if you live in the US. Click the above link and fill out the short form on the home page to open your BetOnline account. BetOnline accepts players from across the United States and has become one of the most popular and respected betting sites serving the US market over the past two decades. Next you will have to fund your account with the money you want to bet on UFC 229. Click on ‘Cashier’ from the top menu bar after logging into your account. Select any of the deposit methods and complete the instructions to make your deposit. BetOnline accepts credit cards, cryptocurrencies and various e-wallets. You can withdraw via most of the banking methods, and you can also request a bank wire or check through the mail. Click on ‘Sports’ from the top menu bar, open the ‘Other Sports’ drop down menu and select ‘MMA’. Choose the UFC 229 bet you want to make and click ‘Straight Bet’ under Bet Slip on the right sidebar. Enter your risk amount and click ‘Place my bet’ to lock in your wager. If you’re a new bettor check out our sports betting guide section for some beginner betting articles to help get you started. The understanding odds page is the most important for new bettors because you need to understand the betting odds to know your risk/reward on your UFC 229 bets.